Needles: size 10.5 and 8. This hat is not knit in the round so you can use straights if you want. Yarn used: 1 skein Mountain Colors 3ply Montana Wool in Blue Sky or 3 oz. bulky wool. Leftover Rowan chenille in Mustard. Cast on 27 sts with 10.5 needles. Row 1: Knit 2, purl 1. Repeat to end. Turn. Row 2: Knit 1, purl 2. Repeat to end. Turn. Repeat rows 1 and 2 for 14 inches. Change to size 8 needles and continue in pattern for a total of 20 inches. Bind off in pattern. With size 10.5 needles and right side facing, pick and knit 48 stitches along selvage edge. Rows 1, 3, 5, 7, 9: Purl. Row 2: [K 4, k2tog] 8 times. Row 4: [K 3, k2tog] 8 times. Row 6: [ K 2, k2tog] 8 times. Row 8: [K 1, k2tog] 8 times. Row 10: K2tog 8 times. Cut yarn leaving about 24″. With a darning needle, weave through the 8 stitches, then sew the seam together. With wrong side facing, pick up and knit 8 stitches, 4 on either side of the seam. Row 1: K 1 through the back loop, k 6, k1tbl. Row 2: Slip1, p 6, slip1. Repeat rows 1 and 2 for 6 inches. Bind off and leave 12″. Sew end to top rib. Make flower and tack to band going through hat for stability. With size 8 needles, cast on 222 stitches. Row 2: Knit 2, [k1, return to left hand needle, pass next 8 stitches over the knit stitch, going from left to right, reknit 1st stitch, (9 stitches become 1 stitch), k2] repeat to end. 62 stitches. Row 3: K 54, wrap next stitch and turn. Row 4, 6, 8, 10, 12, 14, 16: Knit. Row 5: K46, wrap and turn. Row 7: K38, wrap and turn. Row 9: K30, wrap and turn. Row 11: K22, wrap and turn. Row 13: K 14, wrap and turn. Row 15: K6, wrap and turn. 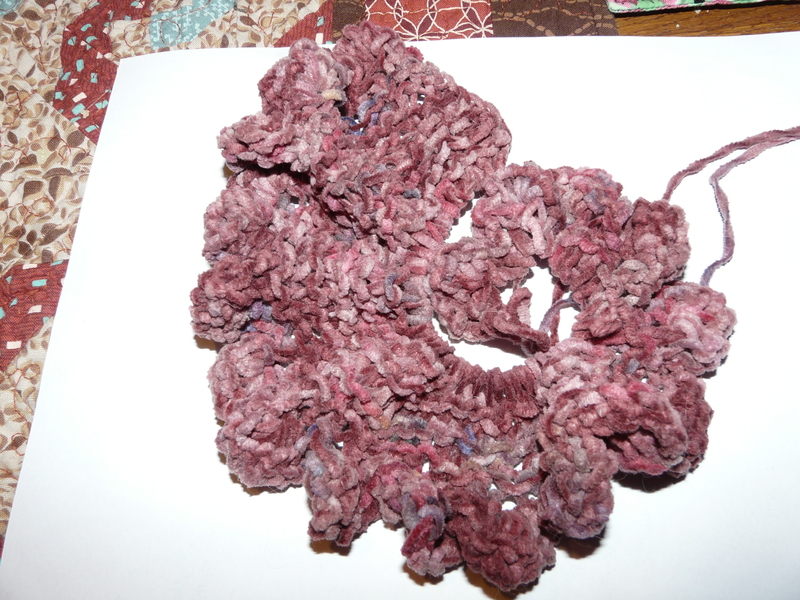 Cut yarn, leaving about 12″ and thread through stitches. Pull tightly and help flower into a circle. Tack down with a few stitches. Sew to cloche. Put it on and admire yourself in the mirror. It is a great ear warmer for cold windy weather. If you have any questions, leave me a comment or write me at frivolousfluffy@gmail.com . P.S. I went over this pattern again and added a few words and pictures. A reader needed some help and this was the only thing that I could think to do. I hope it helps. 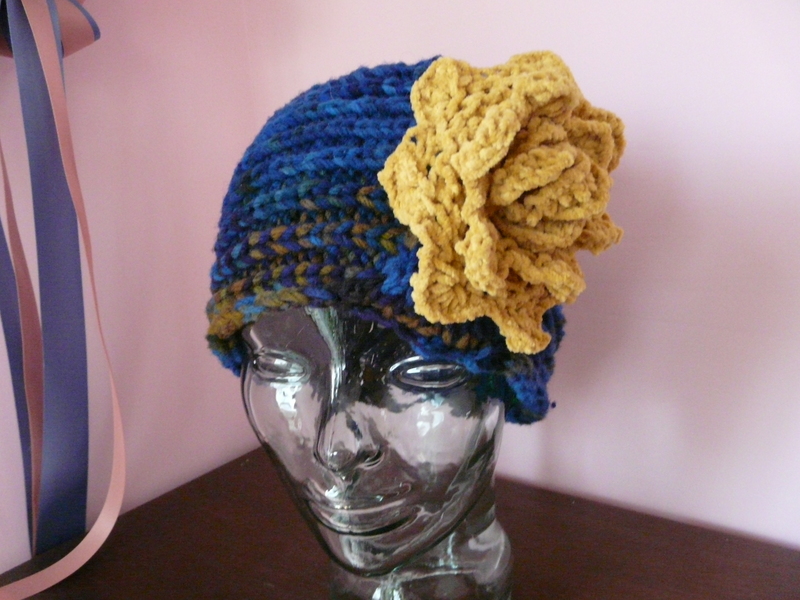 I have wanted to do a hat with a great big flower!!! VERY EASY Im greatfull you shared this pattern with me!!! Thank you for posting such a great pattern! 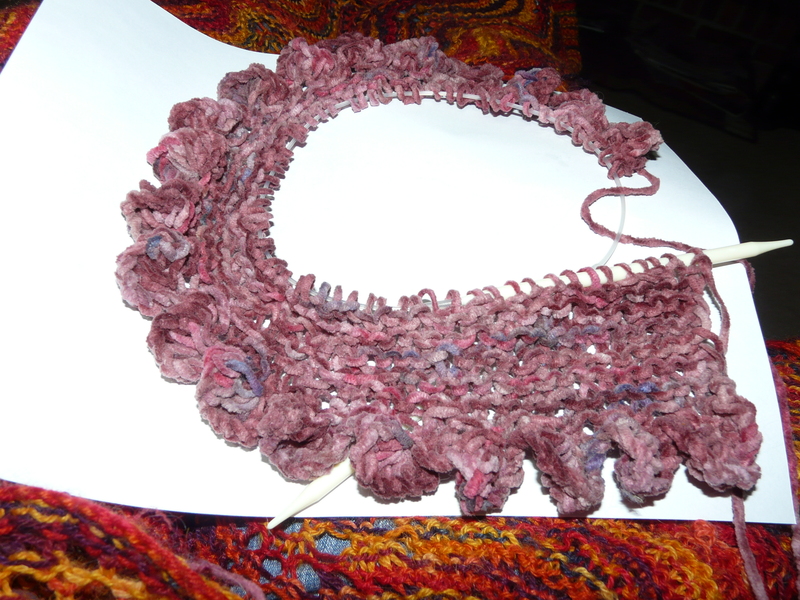 It is a while since i did any knitting, could you please tell me what wrap and turn is. Many thanks. 1. With yarn in back,slip next stitch as if to purl. Bring yarn to front and slip stitch back to left-hand needle. Turn work. 2. With yarn in front, slip next stitch as if to purl. Work to end of row. 3. 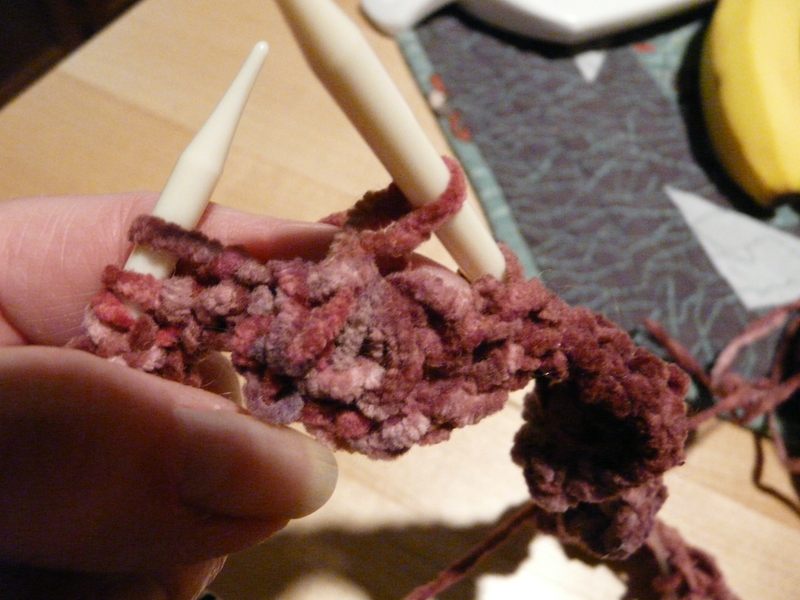 When you come to the wrap stitch, hide it by knitting it with the stitch it’s wrapped aound. If a visual will help, try U-Tube. Type in Wrap and Turn. Also, most knitting magazines have glossaries that may help. Thankyou very much for that. Great help, cannot wait to get started. I’m having trouble on the flower. Can you provide more info on what the instructions mean here: pass next 8 stitches over knit stitch from left to right. I’m just not sure what I’m doing here. Please forgive me for not promptly replying. I was away for several days. I have several things to do before I can get back to my knitting. 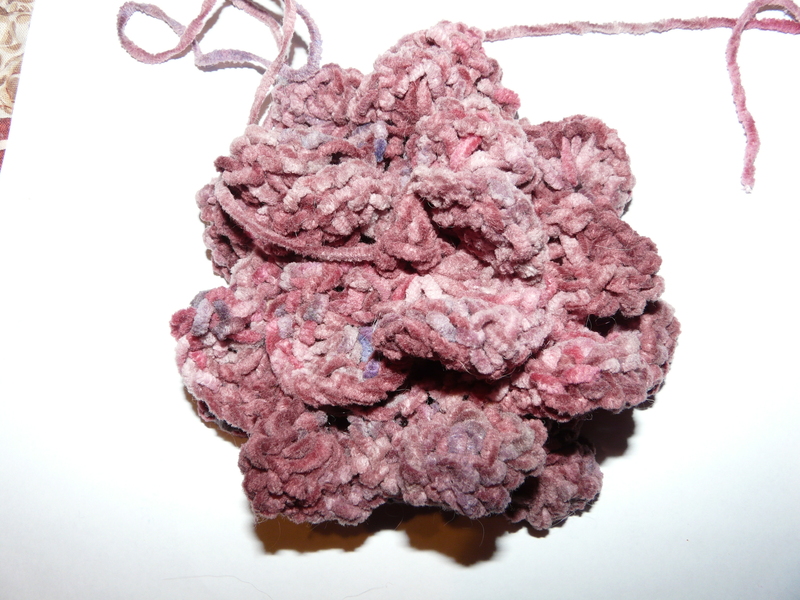 I thought I would take some “in progress” pictures as I make a flower. It will also help me to explain it to you better. Talk to you soon, Fluffy. Ann, I have added some pictures to help you. I’m afraid I don’t know what else to do. I asked some of my knitty friends, but they could not come up with anything either. I have a question about the hat…the little tab (4 stitches on either side of the seam) that you knit at the end and “attach to the top rib”… What exactly is that for? And where is it on the hat, under the flower? What is the “top rib” ? I thought maybe it gathered the hat but the picture doesn’t look like the hat is gathered. If I could see it in the picture or know where it goes or what it is for, I think I would understand better. Also, you say to attach the flower to the band going through the hat for stability. What do you use for the band, how is it attached to the hat? Thanks!